The Colt M4 Carbine is a spot on .22 LR replica of the current carbine version of the M-16 machine gun issued to U.S. military. It features a carbine length barrel, collapsible stock and removable carry handle. As with the original, the upper and lower receiver is made of high quality aluminum. 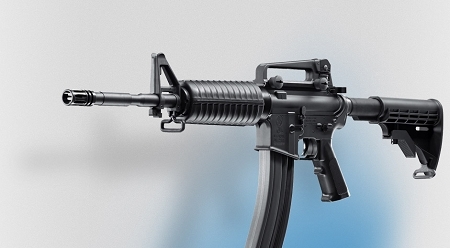 The Colt M4 Carbine Semi-Automatic Rifle in .22 L.R. is manufactured exclusively by Walther under license from Colt. It is the only genuine Colt tactical rimfire replica available in the world.